Is Toronto becoming just like Manhattan or is it yet another excuse used by real estate agents to justify the ever-rising home prices? Brad Lamb is right when he says that even if you make a million dollars a year, you still can't afford to buy a house in Manhattan. The supply of detached houses on the island is almost non existent and the median apartment price reached $865,000 this past June. 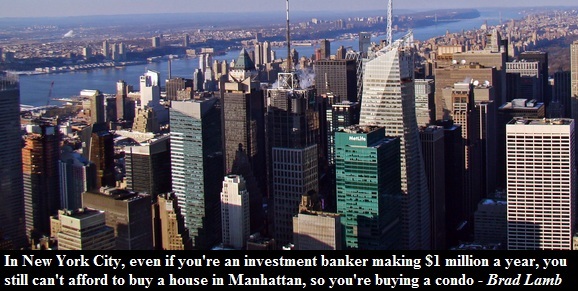 But why are home prices so high in Manhattan in the first place? According to The Atlantic, there are two main reasons that prices spike in places like Manhattan. The first reason is that people want to live closer to all the amenities such as restaurants, museums and theaters. The second reason is the economic leverage that Manhattan has with all its high paying jobs as well as the fact that people want to live close to their place of work. Also, you can't forget that Manhattan is an island (59 square km) with a population of 1.6 million people. Population density is roughly 27,000 people per square kilometer. In contrast, the City of Toronto covers 630 square kilometers and has a population of 2.6 million people with the population density of just over 4,000 inhabitants per square kilometer. 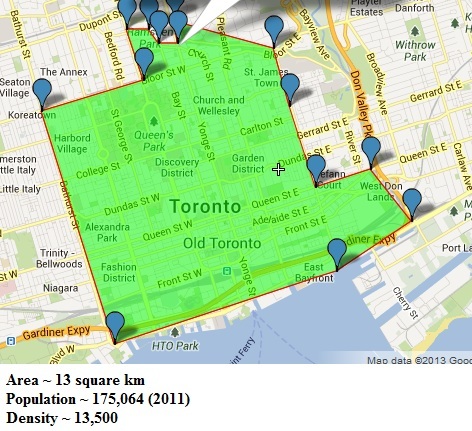 Downtown Toronto has a population of 170,000 and a density of 13,500 people - half of Manhattan's. The median apartment price in Toronto was $330,000 this past June and $373,000 in the city's core. The median home price of detached house in the eastern part of downtown was $1,500,000. While the price of free-standing homes is still high, it is definitely something that one can afford if you make a million dollars a year! If you use Brad Lamb's quote as a criteria for a city becoming like Manhattan, then Toronto is still far away from it. So far I compared Manhattan to Toronto, but Manhattanization does not directly mean that a place is becoming just like Manhattan. So what else does Manhattanizion mean? According to Wikipedia Manhattanization means construction of many tall or densely situated buildings which transforms the appearance and character of a city. According to this definition downtown Toronto is indeed becoming Manhattanized. Dozens of new condo and office towers have transformed the skyline of the downtown core over the past decade. The character has also changed as the population grew by 16% between 2005 and 2011. Yet, recently Manhattanization was also used to described the condo boom in Miami, where 50 condo towers were built between 2003 and 2008. The term was often used by real estate agents and people of interest to justify ever increasing housing prices. We all know how that ended for Miami. Miami isn't Manhattan and neither is Toronto. 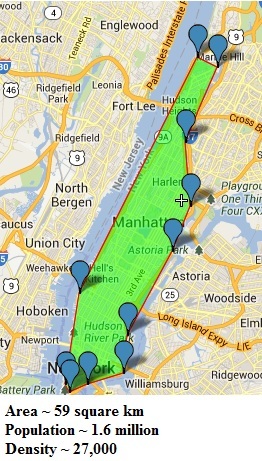 Since Manhattan is an island you only have so much land available for development. One of the biggest differences between Manhattan and Toronto is that there is still some land left within the city limits. For example, the revitalization of Toronto's waterfront covers an area of 800 hectares which is roughly equivalent to the size of the downtown core. The revitalization vision includes the 300 hectares of new public spaces and parks, 1 million square meters of commercial space and roughly 40,000 new residential units. Most of the housing that is planned to be constructed on Toronto's waterfront are apartment buildings. However, just because Toronto is building up doesn't mean that Toronto is becoming like Manhattan in terms of prices. Yes, many people want to live in the downtown core for the same reasons that New Yorkers prefer to live in Manhattan. Yes, detached homes are becoming more scarce in the core with every passing year and prices have continuously increased (so far). Yet with the supply of land that is available for the condo development, prices for apartments will never catch up with Manhattan. Finally, given the Miami experience, the term "Manhattanization" should come as a warning sign of a coming condo bust.